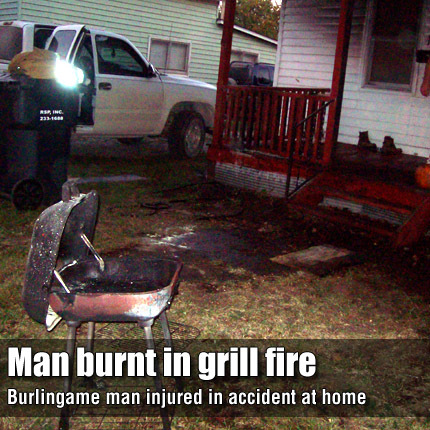 A scorched barbecue grill and charred front porch were the result of an accident that severely burned a Burlingame man Sunday. A Burlingame man remains in the University of Kansas Hospital burn center from a flare while lighting a charcoal grill Sunday. The Osage County Sheriff’s Office reported it received a call at 6:38 p.m. Oct. 2, about a possible explosion at a house at 113 E. Lincoln St., in Burlingame. When deputies arrived at the scene, they were advised that Aaron Rowley, 23, was attempting to light a barbecue grill with gasoline when it flared, burning him and the porch of the house. Rowley was transported by American Medical Response to Stormont-Vail Regional Health Center, Topeka, and later transferred to the University of Kansas Hospital Burnett Burn Center, Kansas City, where he was as of Tuesday. The hospital declined to release information about Rowley’s condition. A witness said it appeared Rowley was severely burned. A neighbor reported she heard Rowley yelling for help, and she went to his aid as her children called 911. Another neighbor arrived with a fire extinguisher about the time Osage County Fire District No. 6, Burlingame, arrived. In a press release, the sheriff’s office said the fire department and neighbors extinguished the fire. The sheriff’s office reported no one else was in the home at the time of the accident. Rowley is an assistant football coach at Burlingame High School.